Like a carefully crafted snapshot, Into the Lens captures a moment—specifically, the one four-hundredth of a second that, when a magical camera lens snaps, transports sisters Gwen and Daisy from a secret room in their father’s house to a new world. Avedamina is a land where weeks of adventure are experienced in less than one second of human time. It was once filled with beauty and color, but is now painted with only shades of black and white. Fires burn as gray as the fireplace bricks behind them, and snow that was once pink is now paler than white. Even the animals that live there—turtles, lions, bears, squirrels, and koalas among them—have lost their natural shades, which in Avedamina can be burgundy or turquoise as easily as black or tan. “It was beautiful,” Juicebox the koala bear tells Gwen. But that was when Atlas, the giant polar bear, ruled. Now, angry King Roger, a fifteen-year-old boy from California, is in charge, taking both the life and color out of the Avedaminans waiting for Atlas’ return. A prophecy that says a young girl like Gwen will defeat and kill King Roger puts the sisters in danger. 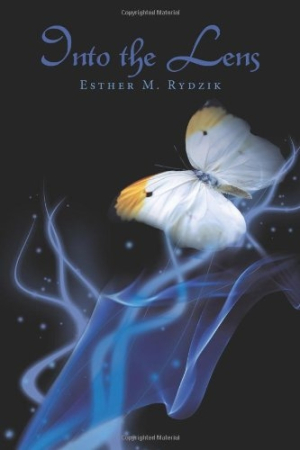 First-time novelist Rydzik has clearly put much thought and creativity into the text, and used her training at the Brooks Institute of Photography in Santa Barbara for inspiration. The story is unique, as are the characters. Fans of C.S. Lewis’ Chronicles of Narnia will see undeniable similarities between Juicebox and Mr. Tumnus, between Atlas and Aslan. And just as Lucy finds Narnia by opening a wardrobe, Gwen discovers Avedamina by opening the door to a secret room. Rydzik’s characters do take on lives of their own, though not to the extent most fantasy fans would desire. The author does more telling than showing, which makes the characters flat and one-dimensional. Readers learn early in the book that Gwen and Daisy are unhappy about their parents’ recent divorce, but are not given any details about the relationship. It is also unclear why Gwen unconditionally and unfailingly loves and defends the sister who continually pinches, kicks, demeans, and insults her—even tries to kill her. In addition, much of the dialogue as well as the characters’ reactions to events are unbelievable. For example, when Gwen discovers that Daisy has become Roger’s queen, she is more interested in Daisy’s new hairdo than the fact that she has sided with the enemy, or that the last time she saw Daisy, she was being swept down a river. Like a compelling photograph, a quality story contains depth, something that Into the Lens lacks. Rydzik’s ending leaves the door open for a sequel. Hopefully, if she pursues it, Rydzik will create characters as colorful and vivid as those in Into the Lens have the potential to be.